On a sweltering summer afternoon in August of 2003, 21 North American power plants suddenly crashed offline, leaving 50 million people without power across the northeastern U.S. and the Canadian province of Ontario. The outage stopped trains and elevators and disrupted everything from cellular telephone service to hospital operations and airport traffic. In New York City, it took more than two hours for passengers to be evacuated from stalled subway trains. 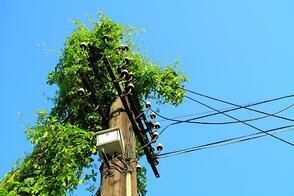 Overgrown vegetation poses many threats and liabilities for pole owners and attachers. In addition to causing outages by interfering with electrical transmission, dense brush can interfere with work crews' ability to access infrastructure, potentially slowing down repairs and prolonging outages. Additionally, a lack of clearance around poles and wires due to obstructing plant growth can threaten line workers’ safety and result in NESC violations. What Can Pole Owners Do? As with many maintenance-related problems for utility poles, simply discovering and addressing vegetation overgrowth is the toughest part of the battle. Regular, thorough field inspections are the best path to complete visibility of the current status and condition of your assets, but the information gleaned from field inspections has to be transmitted effectively in order to be useful. One great way to keep track of the clearance space on poles and wires, and document maintenance, is to employ a robust joint use inventory and management solution. Software that gives utility pole owners information about—and control over—day-to-day maintenance is the remedy for issues like this. Online cloud-based information makes current pole statistics accessible to all departments within an organization. Features such as the ability to put timers on common tasks makes keeping up with routine checks more efficient and traceable. The sum total of these features add up to valuable benefits: a more organized, connected view of all utility poles and their attachments, and a safer and more reliable source of electricity for consumers and businesses. Are your field assets ready for severe weather? Download our eBook, Readiness and Restoration: Limiting Outages in Severe Weather for valuable information about how accurate inventory can help ensure readiness, and the ways that infrastructure asset management can support service restoration.